The Genome 10K Project is assembling specimens of thousands of animals spanning a broad range of evolutionary diversity. Photos courtesy of San Diego Zoo. David Haussler, a professor of biomolecular engineering in the Baskin School of Engineering at UC Santa Cruz, helped organize the meetings. The Santa Cruz 2011 Genome Assembly Workshop (March 14 to 16) will focus on the critical problem of assembling data from whole-genome sequencing projects into complete and accurate genome sequences. 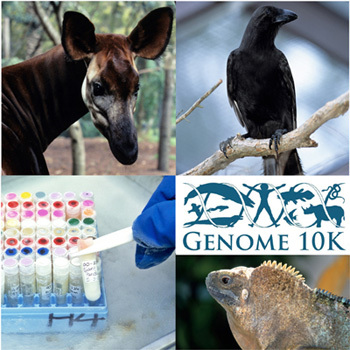 The 2011 Genome 10K Meeting (March 16 to 18) brings together scientists involved in the Genome 10K Project, which aims to sequence the genomes of at least 10,000 vertebrate species. "These joint meetings will be pivotal for charting the course to an exciting future for biology," said Haussler, a cofounder of the Genome 10K Project and director of the UCSC Center for Biomolecular Science and Engineering. As part of the Genome Assembly Workshop, researchers will discuss the results of an "Assemblathon," a collaborative effort to improve methods of genome assembly. DNA sequencing technologies generate raw sequencing data in short fragments, so computer programs are needed to assemble the fragments into a complete genome sequence that represents how an organism's genetic code is arranged in its chromosomes. Adding to the challenge is an ever-changing landscape of new sequencing technologies that yield sequence fragments of different lengths. The Assemblathon, led by Ian Korf of UC Davis, is designed to compare the strengths of different genome assembly programs. "Solving the genome assembly problem will be essential for many projects that will have enormous impact on medicine and biology," Haussler said. "Through the Genome 10K Project, comparative analysis of different species will enable us to deduce the actual changes in DNA that define the different animal lineages. Also, for the first time, people are sequencing entire cancer genomes, which will help us recognize recurrent aberrations that drive pathology in different types of cancer." A pilot project now under way for Genome 10K will sequence and assemble genomes of the first 100 to 120 species, a diverse group of reptiles, mammals, fish, birds, and amphibians. At the Santa Cruz meeting, researchers will assess the progress of these efforts and chart the course of the full project. "Comparing the genomes of different species will help us understand how we became human and how other vertebrate lineages gained their extraordinary capabilities," Haussler said. In addition to Haussler, the meeting organizers include Joe DeRisi, professor of biochemistry at UCSF; Jasper Rine, professor of genetics, genomics, and development at UC Berkeley; Oliver Ryder, director of genetics at the Institute for Conservation Research, San Diego Zoo, and adjunct professor of biology at UC San Diego; and Stephen O'Brien, chief of the Laboratory of Genomic Diversity at the National Cancer Institute. Ryder and O'Brien are cofounders of the Genome 10K Project. The meetings, which will take place at Chaminade in Santa Cruz, are sponsored by the American Genetic Association (AGA), California Institute for Quantitative Biosciences (QB3), Genome Canada, Howard Hughes Medical Institute, Illumina, Life Technologies, and the UCSC Center for Biomolecular Science and Engineering. The Genome Assembly Workshop is also sponsored by the Wellcome Trust.